There is a house that I sometimes walk past with Bea, on those days when a long walk is in order. It’s a funny little house, with a whole menagerie of cement animals decorating the patch of a yard. A stone wolf guards the porch steps, and several brightly-colored parrots hang from the eaves. Two enormous stone toads glare at the passers-by. But the pièce de résistance are the two ponies, ancient and weathered, anchored to a sapling and gazing placidly at the passing traffic. 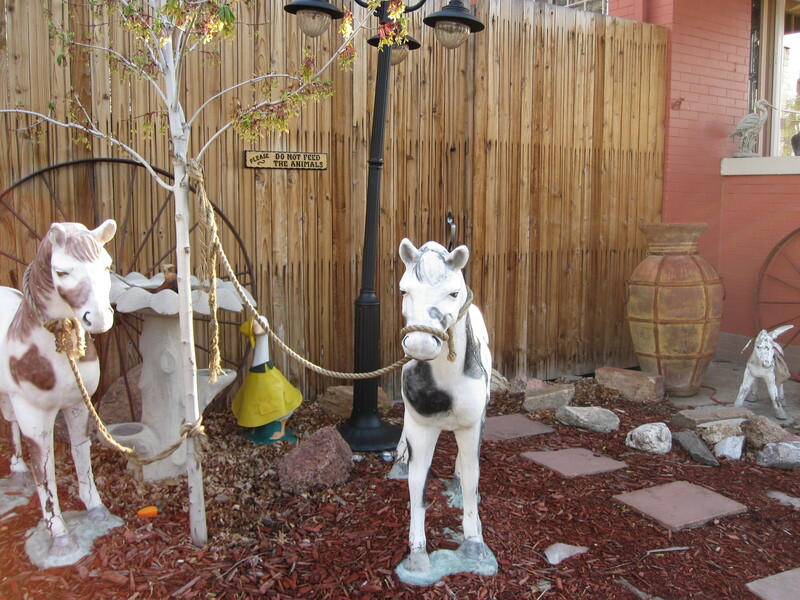 It’s a wonderful yard, ridiculous and tacky and simply fabulous. The stone ponies look on....they don't appear to like my camera. Now, when Bea was younger, she had trouble differentiating between these stone animals and the real thing. When we passed a garden sculpture, she would yip and jump and bound in circles in an attempt to entice it to play. She crept up and sniffed noses, and ran in more circles, while I laughed and laughed and looked for random strangers who would share my amusement. This yard, with its ponies and toads and wolf, was a bonanza of potential playthings, and I enjoyed walking that route just to see how Bea would react to the display. Eventually, or course, Bea figured out the trick, and stopped freaking out at every lawn sculpture we passed. (This is not to imply that she has stopped amusing me on our morning walks. Today, for example, she was surprised by a brightly-colored, inflated beach ball. A stationary beach ball, covered in dew and resting on the other side of an iron fence. The normally silent Bea barked at it, then approached slowly for a cautious sniff, tail held high.) These days, we usually walk past cement pigs, geese, and even horses with barely a curious glance. The point of this story, though, is to say that this is a house I’ve noticed. I’ve been wandering past the stone ponies for two years now, and it’s impossible not to notice them and all their companions. 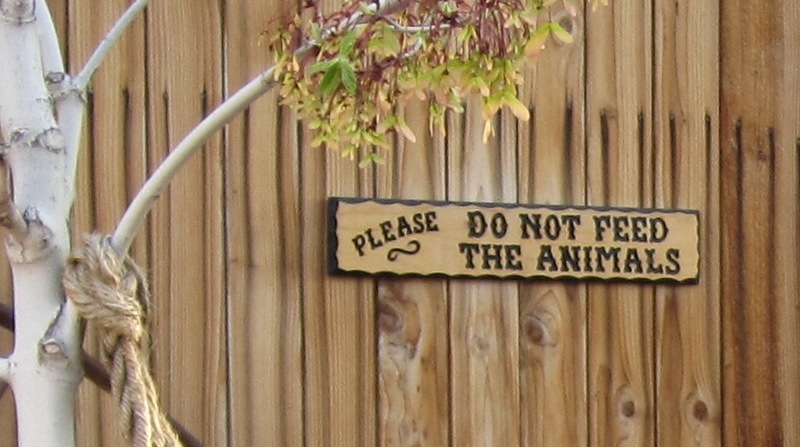 And yet, this morning I noticed a yard detail that I have never seen before: the sign on the fence behind the horses, which reads “PLEASE DO NOT FEED THE ANIMALS”. Oh, the joy of it! I love this sign. How did I not notice it before? Has it always been there?